364 days ago, this blog kicked off with a contest to discover the Catholic Hipster of the Year for 2014. It was a hard fought battle, won by the amazing and talented Anna Mitchell. Since that time, she has reigned over the Catholic Hipster World as our Queen. The time has now come for Anna to pass on the honor of being the Catholic Hipster of the Year. She has carefully selected a list of nominees sure to excite the hipster in all of us. The beard, the glasses, the home overflowing with kids...John Leyendecker is the total Catholic Hipster package. He also describes himself as a Ruthenian Byzantine Catholic, which is more hip than anything I can claim to be. John is one of the full-time instructors at the School of Faith, providing spiritual and doctrinal formation to Catholics in and around Kansas and across the world, and he's looking for your hipster vote. If this was a Catholic beard convention, we'd be pretty on point. Rob is one of the masterminds behind Spirit Juice Studios out of Chicago, Illinois. Spirit Juice is a multidisciplinary design studio working mainly in film and video. Rob and his crew are pumping out high quality Catholic media content like few others across this fine land, and he's also often seen rocking suspenders, which is kind of a big deal in Hipster-ville. So, we may have dropped off with our beard cred a little bit, but Aly is here to bring the straight up feminine genius to this Catholic Hipster parade. Aly is a talented speaker, singer, and songwriter, traveling around to bring the Good News to as many souls as possible. Aly and her guitar are bringing some serious Catholic love your way, and you should pretty much stop what you're doing and vote for her right this very minute. Leticia has burst onto the Catholic Hipster scene with full force lately. She has a way of speaking the truth that most only dream of. Her thoughtful blog posts, hilarious tweets, and out of this world political debate coverage are the stuff of legends. She recently got picked up by Patheos, and this has only furthered her reach into the Catholic Interwebs. Plus, she loves to drink, smoke, and swear. You can't make this stuff up. What can I say about Mary Rezac? She's the Queen of CNA, bringing us all of our favorite articles from our favorite Catholic news source. Did you see the coverage of all the best beards from the Synod? That was Mary. Did you see the coverage of the priests who were evangelizing by souping up classic cars? Mary again. Did you see the coverage on the Pope's recent comments about ways not to prevent HIV/AIDS? Yep, you guessed it. Plus, Twitter photos where you're drinking out of a mug, am I right? Anna is throwing her co-host a bone with this one. The King of Catholic Hipster Contests, Matt Swaim, is quite proud of the fact that he has never won...ever. He's sure it solidifies him as the actual supreme Catholic Hipster. He was also the leading front-runner in last year's contest before Anna Mitchell snuck in at the last second with her impressive and memorable walk-off victory. Matt is the ultimate Catholic Hipster, let's be honest. He eats weird food, is obsessed with all things geeky (especially Catholic geeky), and taught Anna Mitchell everything she knows (just ask him). So, there you have it, folks. 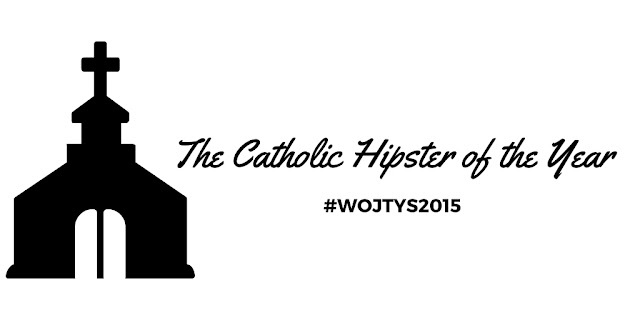 The nominees for the Second Annual Catholic Hipster of the Year Award, the Wojtys! Voting closes at 11:59 PM on New Year's Eve. We'll be posting updates to the award voting as the contest rolls along, including anything that the nominees tweet out that may help guide your vote. Click on your choice over on the right hand side of the page, and be sure to let everyone on Twitter know who you're going with, because this event tends to get nuts, and you're going to want to be a part of it. John Leyendecker gets my vote! I think a pastor is obligated to vote for one of his flock, but I'd vote for John regardless. He and has family are great witnesses for the faith. You better find me some Lvivske Bilyi Lev beer, John, for this endorsement. I'm voting for Leyendecker, but I'm not sure if this site understands what a hipster is, lol. THE John L has my vote! His goddaughter, who is 4, also casts a vote for him. The Swaffords love John Leyendecker and Family!!! Just to clarify, I'm the one on the left. Ran into that dude randomly at the Mayfield Creamery factory tour. Had to nab the Dark Side/Light Side selfie. "Aly Aleigha is here to bring the straight up feminine genious to this Catholic Hipster parade." www.aly-aleigha.com If you haven't voted, Aly Aleigha is the perfect choice! Mary Rezac! Vote for the woman with a beard on her (coffee) mug - who also wrote about beards. At a synod. John Leyendecker's "Would Pope Francis Smoke Pot?" talk at SEEK 2015 was the stuff of legend. He gets my vote. Mary Rezac for Supreme Ruler of the World--I mean, Catholic Hipster of the Year. Mary R all the way. John Leyendecker is making hipsters of all nations. John Leyendecker gets my vote, though it's a tough crowd. John Leyendecker for the win! Rob K for the win! As John Leyendecker's Padrino, I'm voting for him. I knew the man before he converted, and he is without a doubt the most hip Catholic man I know. One of my heroes. Talking to kids and on EWTN in the same year. Bam. Rob from Spirit Juice is LEGIT. #1 John Leyendecker is my next door neighbor and he has our vote! Better late than never. Voting for john lyndecker. John Leyden decker has my vote! John Leyendecker. He's 1/1000th as cool as my husband.